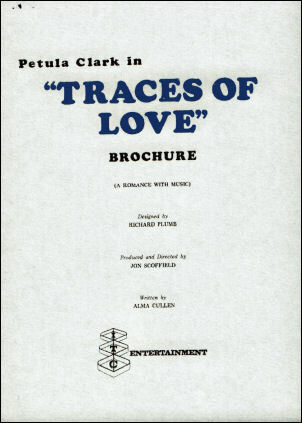 In 1979, Petula Clark was invited by ATV to appear in her first TV musical, a one-hour romance with music entitled TRACES OF LOVE produced by ATV at a cost of £100,000. 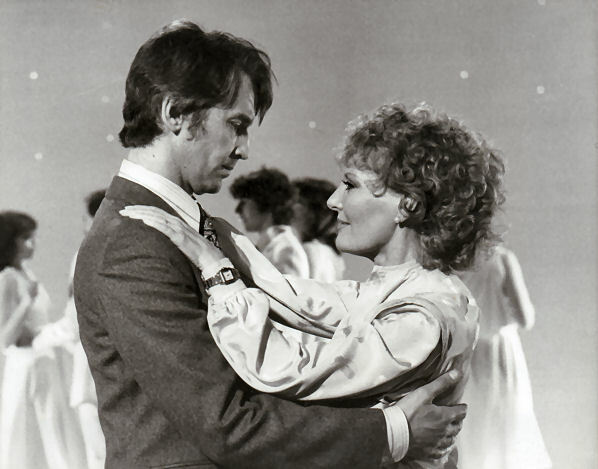 The production was a chance for Petula to demonstrate her musical versatility and to prove her talent for straight acting in the part of Polly Curtis. TRACES OF LOVE which took its title from the musical number, was a departure from her usual television appearances. At the time Petula commented: "I'm getting a little tired of standing before an audience, singing beautiful songs and dressed in beautiful gowns. This is something different. I don't know whether my fans are prepared for it. This is no light-hearted show with the hero and heroine living happily ever after. I've never done anything like this before. I'll be very curious to see what people think!" 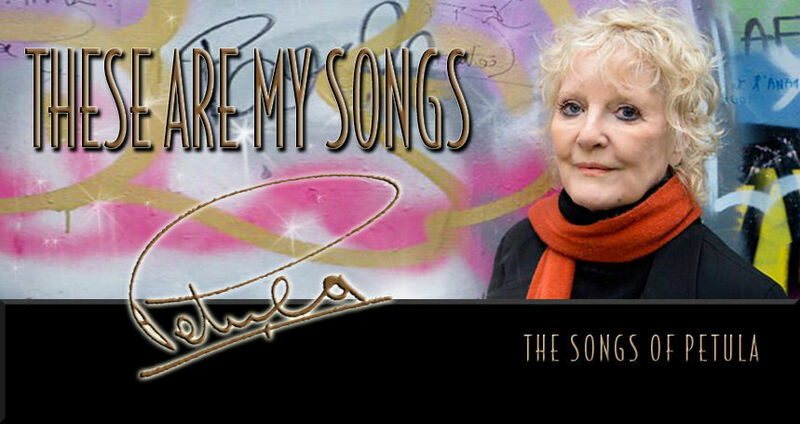 TRACES OF LOVE was tailored to Petula's talents. The one-hour special was written by Alma Cullen and was devised in a way not only to allow Petula to act but also to sing a string of popular standards including Ev'ry Time We Say Goodbye, I'm Feeling Too Good Today, Start All Over Again and I've Just Begun. Each lyric was an integral part of the story. 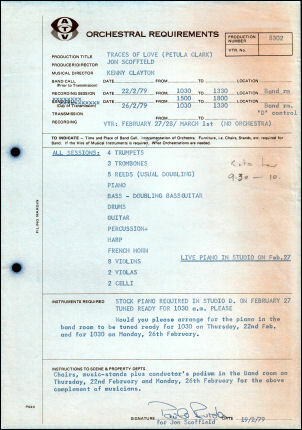 TRACES OF LOVE was billed as a television special with a difference. The songs underlined the action story with a sting in the tail - and tale - where a successful woman is unable to combine a career with marriage. As the editor of 'Know How', a glossy woman's magazine, Petula's character Polly Curtis offers advice to women on how to attract and hold onto their men - it was quite a different matter when Polly's own husband goes off the rails! Sandor's romantic appeal was heightened considerably when he played a leading role in the TV "The Foundation" series. The husband's new girlfriend is never actually seen. In every shot, she is lying on a sofa, out of sight except for her hand stretching out over the top or caressing the husband's hand. Karen's lovely hands have been seen in numerous TV commercials. At the time, the director Jon Schofield commented: "We had to search for a girl who could act as well as having pretty hands because she does in fact, have to use her hand very expressively - in fact, acting with it, and she is actually acting the part although one can't see her face!" The producer and director Jon Schofield who was ATV's head of light entertainment explained at the time: "The time has come for us to move ahead in light entertainment. The conventional 'special' has had a long run - the show in which one star has a supporting bill of other stars. We have got to look ahead, and TRACES OF LOVE breaks away from the usual format. It is something new". It's a fact: In 1971, Jon Schofield directed Petula when she was a guest on THIS IS TOM JONES produced by ATV (pictured above). In TRACES OF LOVE, British actor and singer David Kernan portrayed the husband and Paul Jones (Manfred Mann) played the PR man. 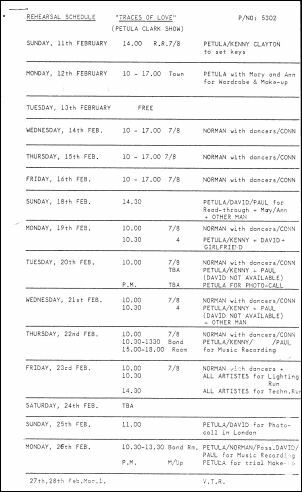 It's a fact: David Kernan first worked with Petula in the 1964 BBC TV special LANGUAGE OF LOVE. 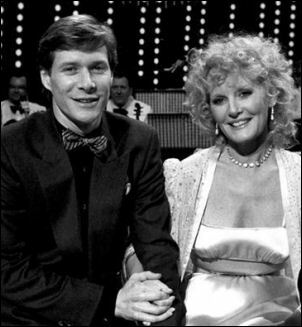 Paul Jones went on to appear with Petula as one of her special guests in the 1983 Yorkshire TV special PETULA ... CONCENTRATES ON YOU (pictured above) as well as performing on three 1985 demo recordings for the Clark / Shipman musical SOMEONE LIKE YOU. Production work and filming for the special began on 04 February 1979 and concluded on 01 March 1979 at ATV Studios, Elstree. The recording sessions for the musical numbers took place on the 22 and 26 February 1979 across 3 sessions at Elstree Studios with 31 musicians (pictured right) conducted by Kenny Clayton who was also musical arranger and musical director. Filming took place at ATV's Elstree Studios (Studio D) on 27, 28 February and 01 March 1979. The special was broadcast on the independent television network on 04 April 1979 at 8pm. Petula Clark is living proof that dual nationality does exist - even if, occasionally, you find yourself being pulled in conflicting directions. When she first met her husband, Claude Wolff, almost two decades ago, she was a shy, retiring English sensation, speaking no French at all beyond the hesitant schoolgirl variety. 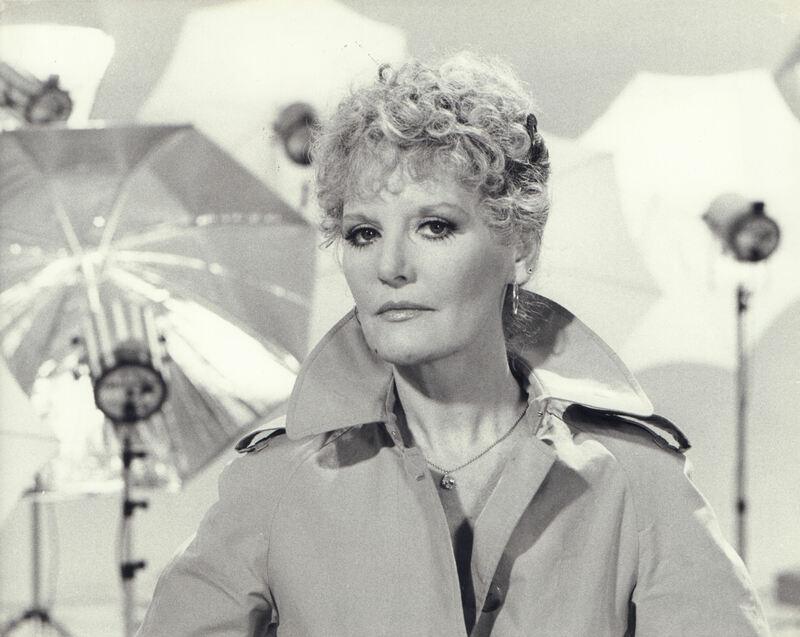 There is still a youthful vulnerability about the mature Petula (on the first day of recording TRACES OF LOVE she confessed to hardly sleeping the night before worrying about the show), but these days Petula is fluent in French as she is in English. She still feels an enormous attraction to England, loves coming home for professional and private reasons, but she lives in Geneva and has raised a bi-lingual family of whom, she says, the two girls (now teenagers) are very French and feel no real ties to England while her son, Patrick, is having an English education and could, she feels, be as at home in England, as Petula is herself. "It's interesting, and I think it probably comes down to education," Petula said. "The girls, although they're completely bi-lingual, are more at home in France. They feel a pull towards Paris, which is where their friends live, than they do towards London. They had a French education and naturally enough that's their home. Patrick is having an English education and I think will feel more English in inclination. Petula is equally at ease in both places. In fact one of her loveliest records, "Two Rives", extolled the virtues of the two cities she loves - London and Paris - and the lure she felt towards them. "When I first met my husband and was working in France, I hardly spoke a word, but I had to learn fast to survive. My musicians were all French so I couldn't communicate with them except in sign language until I'd learned to get by in French. Anyway," she shrugged in Gallic fashion, smiling, "I was in love and it was all very exciting. I picked up the language fairly fast". With the international language of love filling gaps? "That's right. It's a good way to learn a language. I'd love be fluent in Italian but I haven't the time". One suspects Claude might not approve of a handsome Italian repeating history! 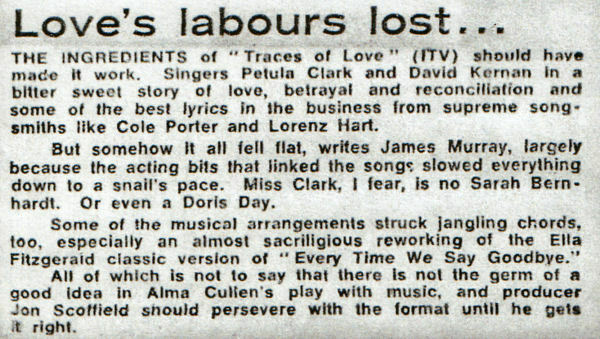 Petula Clark admitted that when her co-stars for TRACES OF LOVE were announced as David Kernan and Paul Jones, she was ecstatic. "I was really thrilled," she enthused. "Partly because I knew David and had worked with him before, many years ago, and was glad of the chance to do so again. Paul Jones I hadn't worked with before, but I've admired him for years. I loved his voice way back when he was with Manfred Mann, and I've watched with pleasure as he developed into an actor". Complimentary sentiments were repaid in kind by the gentlemen in question. David Kernan who, in TRACES OF LOVE, play's Petula's erring husband, and duets with her the Barbra Streisand - Neil Diamond hit, "You Don't Bring Me Flowers", said: Petula and I worked together in the 60s on a BBC TV special - as I remember Petula was supposed to be teaching me French and I remember we giggled most of the time! Has she changed? Well, it may sound like a cliche, but it's true - then she was a child and now she is a woman - she's marvellous, nobody can put a song across like Petula. I am so pleased to be working with her again". Paul Jones who plays a PR man in TRACES OF LOVE and gives counsel to Petula when her husband strays, went through a metamorphosis himself from pop singer to serious actor and fully appreciates the changes Petula has gone through. "The public does typecast you and Petula did very well to get away from the homespun peaches-and-cream image into something altogether more slinky, but still universally appealing. She's a superb performer, her timing is terrific and the show is a pleasure to do. Happiness is a show called TRACES OF LOVE!